Welcome to anyone who comes and visits this journal. I don’t really have an awful lot to write at the moment, because (a) it’s late and I’m sleepy, and (b)it’s been a long day. However, I did want to make this post to say hello to any of the folks visiting for the first time, in response to my email. Thank you for coming out to ‘the journal’. I also want to test out my journal’s newest feature, the ‘Email Subscription’ box in the sidebar here. I must have tried it about a hundred times now to see if I can make it work. It APPEARS fine, but I really don’t know if it actually works or not. So, if you feel like taking the plunge, go ahead, and we’ll see what happens. Hopefully it won’t shut down the entire internet. This is another in my series of aerial photos from Wrangell – St. Elias National Park. We were flying up the Chitina Valley, just west of the University Range, and I happened to look down at the ground below me. 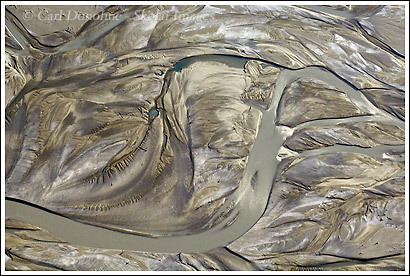 The patterns of the braided river channel caught my eye, as did the various colors in the riverbed. The Chitina River is a glacial formed river, and comes out o fthe Logan Glacier, descending off Mt. Logan, and also off the Chitina Glacier, descending off Mt. George. Mid-summer the river peaks, and is very high, even before the Tana and the Nizina Rivers join its flow. This photo was taken in mid-september, when the water levels had dropped due to some very cold weather. From the air it looks crossable (if backpacking), but I’ve been fooled enough times to know better. Caution wins when it comes to river crossings. More photos of Wrangell St. Elias. Well, I need to get to bed. It’s after 2am, and I have an early morning. If you get the urge, post a reply and sign on the email thing and all that good stuff, and we’ll see if we can make this work. This entry was posted in Aerial Photos, Alaska, Landscapes, Wrangell - St. Elias National Park on April 30, 2007 by Carl D.
Hi Carl – welcome to the world of blogging brother. I hope you have another great season up north where we all belong…. Great looking site Carl! You pulled that together fast. I bet you didn’t really intend to write “f the folks visiting for the first time”. ? I told ya I was sleepy .. and when I get sleepy I get cranky .. and when I get cranky I tend to say things like that. Thanks for posting man. I can’t wait to get up north. Leaving here before too long, bro’. Come on up. I probably should have emailed you instead of adding it to my comment, but I thought you would have a good laugh. I figured you would delete it – you should. Then I can add a more appropriate comment. I laughed my tail off. In fact, I’m laughing about it right now. Ok though – I’ll go ahead and edit it. It did give this thread the highest ever # of comments though. That’s worth something.